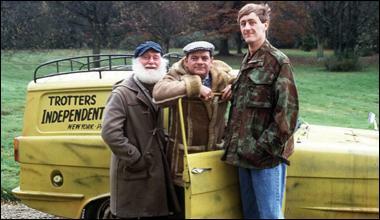 Only you, me and three other fools in London have ever heard of '"Only Fools and Horses." :-) I have the entire series, including all of the specials, on DVD, some region 1, some region 2 - and they all play fine on my Mac. Nothing wrong with educating our American (and other international) cousins with a bit of good culture though! I've had to explain most of the comments to my son and brother. Once they understood it, they were amazed that British TV would let that out. But, then, they've never seen French or German TV either. :-) Either way, they thought that this was a hoot! This is what got them hooked on what we call "Brit Coms" over here. All 14 DVD SETS of Monty Python!! We usually break them out on Shabbos Erev (eve) after services. I know, they aren't very Godly but we like to chuckle (guffaw) at this kind of comedy. BTW, I sent the DVD of "Oh, Brother, Where Art Thou" to some English friends who couldn't understand the English in that movie even with English sub-titles. Why would you be upset? Shouldn't you be happy for the Savvion folks? Not upset at all, as follow up blog says. My attitude, if you knew me, has always been take the lumps with the smooth "Drools Everywhere". As you can imagine being one of the first only ASL projects at JBoss, I've had to work hard for that, and accept that situations like Progress will happen. That the benefits of "Drools Eveywhere" outweigh any freeloading, which actually doesn't impact the community negatively anway. RHT actually make good money on Drools. RHT continue to grow and invest. Progress on the other hand have yet to figure how to make money off OSS and are shedding staff and OSS projects left, right and centre. Actually you're wrong: I'm not a Progress employee. I'm a huge fan of both Progress and Red Hat, and currently I delivery consultant services for both companies and technologies in London. Having said that, even being a fan of Drools and of your work, I don't agree with your comments about Savvion "bad" usage of Drools tech. Like Intalio and WSO2, Savvion is just a consumer of OSS technologies, and they make money with it. Progress | Savvion never helped Drools project? Well, we both know that code contribution is managed by the team leaders of the projects and influenced by the bigger sponsor of the technology, which is Red Hat. So both elements could create barriers to stop other players to be contributors, so you can proudly say: "Hey, we're the master of the technology, we're the only that could delivery professional services and professional support for this tech." I don't think you read that other blog. I have no problem with people making money off Drools, in fact I encourage it. I actively work with organisations such as Intalio, Plugtree, Illation, WS02 - some contribute back some don't. But the main thing is it all adds to the Drools ecosystem, which provides long term health. As my article says I'd rather someone leeched Drools, than build their own or use a competitors. The main thing that separates Progress Savvion from these other vendors I work with is that Progress Savvion are the only ones to pass off our work as their own, there is no acknowledgement or reference to the source of the work. Now while they have the right to do so, it's not really cricket in OSS with regards to being good OSS citizens. As such I figure they are fair game for me to write articles that makes noise and drives traffic to our sites around release time. It'll also deter others from doing the same. Note I differentiate between someone who resells drools "as is" and someone who uses it internally or embeds it as part of a wider solution; where attribution would be nice, but clearly I can't expect it. "Its not wrong make money with OSS, everybody had this right. You have to respect Progress in the same way that everybody in the world respect Red Hat / JBoss ;-) "
As my comment just said, it wasn't about the money, it was passing our work of as their own. We'd never show disrepect like that and do our best to give kudos to other projects. So that point doesn't hold up. "However that said, anyone who knows me, knows I have a mischievous sense of humour and if Progress and Savvion aren't even going to at the very least accredit us then they are fair game and surely myself and the Drools community deserve a little fun at their expense :)"
"there is no acknowledgement or reference to the source of the work"
You're wrong again: There is acknowledgment about the Drools work in Savvion. At it's documentation, release notes and product books, you can easily find references about Drools. "it's not really cricket in OSS with regards to being good OSS citizens"
They give effort back not in the Drools project, but is several others for the OSS community. Don't make this a generalization of your opinion since the only evolved project here is Drools. In OSS, there are many ways to give back, and Progress does his job pretty well. "it was passing our work of as their own"
There are no facts that sustain this sentence. As I said, in Savvion docs, there are references about Drools origins and knowledge about teams work. YOUR point doesn't hold up.